The Mexican Pueblo of Mata Ortiz is a small village in the state of Chihuahua which has a long history, continued today, of the creation of pottery. 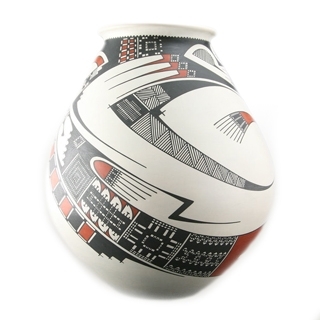 Mata Ortiz pottery is also known as Casa Grandes pottery as the pueblo is located along a tributary of the Rio Casas Grandes, a fertile valley which has long been inhabited by indigenous people. Pottery from this pueblo has seen a revival lead by the effort of Juan Quezada, a self taught potter of the modern Mata Ortiz style whose skills have attracted clay workers from the region, extended family and neighbors to create the distinctive pottery shapes and designs which define the pottery from this region. Many of the designs incorporate mimbres symbolism from Native American culture. Mata Ortiz pottery has become high collectible and been exhibited at the Field Museum of Natural History in Chicago, as well as the American Museum of Ceramic Art in Pomona California and the Amerind Foundation in Arizona.